Elizabeth Stanke Raupp. Courtesy of Raupp Memorial Museum, Buffalo Grove, Illinois. [S7] St. Mary Catholic Church, St. Mary's School Dedication, 136, 150, 154. [S11] John J. Weidner, Compiled Birth, Death, 128, 386, 387, 398, 403, 409, 415, 422. [S1062] Raymond Raupp, State of Illinois; Department of Public Health - Division of Vital Statistics; Certificate of Death. [S1410] Daily Herald, 22 Mar 2011. [S1275] Daily Herald, The, 17 Jun 1986, sect. 1, p. 11, col. 3, Added to show siblings. [S405] The Cemetery Committee, Vernon Township Cemetery Inscriptions, Lake County, Illinois, 98 year only. [S1062] Raymond Raupp, State of Illinois; Department of Public Health - Division of Vital Statistics; Certificate of Death, Birth city, state. This spelling may be incorrect. [S11] John J. Weidner, Compiled Birth, Death, 387. [S11] John J. Weidner, Compiled Birth, Death, 387, death date only. [S1275] Daily Herald, The, 17 Jun 1986, sect. 1, p. 11, col. 3, Death date, hospital name, city, state. 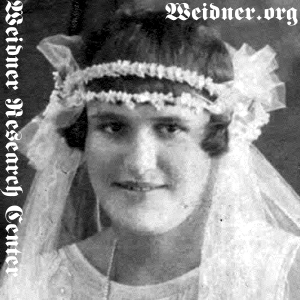 [S11] John J. Weidner, Compiled Birth, Death, 387 cemetery name only. [S1275] Daily Herald, The, 17 Jun 1986, sect. 1, p. 11, col. 3, Burial date, cemetery name, city, state. [S11] John J. Weidner, Compiled Birth, Death, 455. [S237] Daily Herald, 22 May 1998, sect. 3, p. 10, col. 3. [S346] Daily Herald, 27 Sep 2003, sect. 3, p. 8, col. 2. [S1275] Daily Herald, The, 17 Jun 1986, sect. 1, p. 11, col. 3. [S11] John J. Weidner, Compiled Birth, Death, 405. [S11] John J. Weidner, Compiled Birth, Death, 435. [S11] John J. Weidner, Compiled Birth, Death, 422. [S96] Arlington Heights Herald, 17 Mar 1944, sect. 1, p. 6, col. 3.